Results for this study are based on telephone interviews conducted by ICR/International Communications Research, an independent research company, among a nationally representative sample of 2,003 Latino respondents age 18 and older, from Oct. 3-Nov. 9, 2007. Of those respondents, 687 were native born (including Puerto Rico) and 1,312 were foreign born (excluding Puerto Rico). For results based on the total sample, one can say with 95% confidence that the error attributable to sampling is plus or minus 2.7 percentage points for total respondents. For native-born respondents it is plus or minus 4.5 percentage points, and for foreign-born respondents it is plus or minus 3.3 percentage points. For this survey, ICR maintained a staff of Spanish-speaking interviewers who, when contacting a household, were able to offer respondents the option of completing the survey in Spanish or in English. A total of 655 respondents were surveyed in English and 1,315 respondents were interviewed in Spanish (and another 33 equally in both languages). Any adult male or female of Latino origin or descent was eligible to complete the survey. 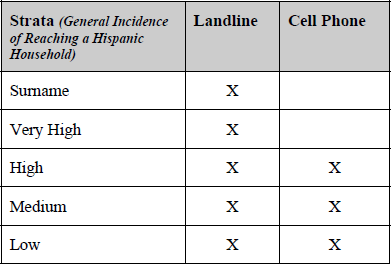 Because a growing number of Hispanic households in the U.S. are reachable only by cell phone, the study included interviews from both landline (n=1,101) and cell phone (n=902) sample frames. According to government statistics from the National Health Interview Survey (NHIS) during the last six months of 2006, 15.3% of Hispanic adults lived in households reachable only by cell phone, a number that was nearly four percentage points higher than it had been in the previous six months. Adults who are cell-only are very different demographically from those reachable on a landline. In particular, they tend to be younger, less likely to be married or have children, or to own a home. It is important to note that the existence of a surname stratum does not mean this was a surname sample design. The sample is random digit dial (RDD), with the randomly-selected telephone numbers divided by whether they were found to be associated with or without a Latino surname. This was done simply to increase the number of strata and thereby increase the ability to meet ethnic targets and ease administration by allowing for more effective assignment of interviewers and labor hours. Finally, the data were put through a post-stratification sample balancing routine. The post-stratification weighting utilized national 2007 estimates from the Census’ Current Population Survey, March Supplement, on gender, education, age, region, foreign/native born status, year of entry into the U.S., and Hispanic heritage.